In Should We Live Forever? Christian ethicist Gilbert Meilaender puzzles over the implications of the medical advances that have lengthened the human life span, wrestling with what this quest for living longer means for our conception of living well and completely. As he points out in his introduction, “That we often desire, even greedily desire, longer life is clear; whether what we desire is truly desirable is harder to say. 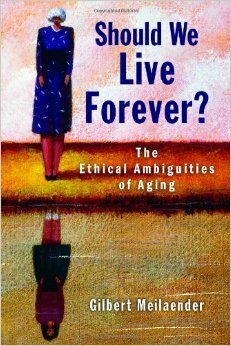 The six chapters of this book take multiple perspectives on issues surrounding aging and invite readers to consider whether “indefinitely more life” is something worth pursuing and, if humans are created for life with God, whether longer life will truly satisfy our underlying hunger. From the publisher.